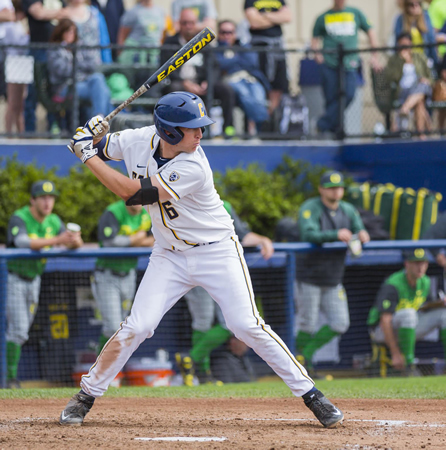 Former Laguna Beach High School baseball player Chris Paul (“11) was named Pac-12 player of the week on Monday, March 15, after leading California to a 3-1 record over the previous week, including two wins over No. 8 Oregon to open Pac-12 play. The Golden Bears are now ranked 24th in the nation. Paul went 6-for-10 with four runs, two doubles, two home runs and six RBI over the four game stretch. He opened the week going 2-for-3 with a three-run homer in a 13-6 route of Pacific (Stockton). In the first game against Oregon, a 9-3 win, Paul went 2-for-3 with a double, a home run and two RBI. The following day he led Cal to a 6-2 win, tagging the Ducks for two more hits, including an RBI double. In the 4-2 series finale loss, Paul went 0-for-1 but reached base three times by walk. The senior first baseman now leads California with a .431 average and a team-best six doubles, four home runs and 17 RBI.